No matter how long you and your partner have been together, going through a divorce is an incredibly emotionally trying time. Just because it’s the best option for your family doesn’t make it an easy choice or a simple process. And if you have children, the process is even more complicated. In a perfect world, you and your kids’ other parent would agree on everything throughout the process. Of course, that’s rarely how the world works. If you are going through a divorce and navigating child custody, there are a few ways you can make the process smoother. Generally speaking, the more you and your ex can discuss and agree on things, the easier the divorce and custody process will be. Before you meet with your divorce and family lawyer, take time to talk to your children’s other parent and see if you can reach agreements on how you’ll divvy up time with the kids — and don’t forget to discuss a schedule for the all-important holiday time. Even if you haven’t reached any solid agreements, having the discussion will give you a starting point. Then, you can meet with your divorce and family lawyer to get the details down on paper, hopefully to be mediated and agreed-upon before everything goes before a judge for final decisions. In terms of family law, a child’s needs always supersede the parents’ wishes. Now, generally that’s not a problem because parents want what’s best for their kids. However, divorce makes it harder to remember that your kids will have a different perspective of their other parents than you do. The judge will question whether your child custody agreement is going to be the best for your kids, which may mean adjustments to the agreement you and your ex came to previously. Generally, mediation with a family law attorney helps mitigate that, but it may still happen. Trying to decide how to split your kids time between two parents can be tough. You want to have as much time as possible so you don’t miss out on any special moments with them. However, it’s important to be reasonable with your expectations. If you know you travel a lot for work, you’ll need to take that into consideration in terms of custody. A judge isn’t going to look favorably on an agreement that has the kids with you 75 percent of the time if you won’t even be there for parts of it. Mitigating circumstances aside, the judge will likely ensure that your kids’ time is shared evenly, and they’ll take your schedules into account too. If you treat it as a business discussion, rather than an emotional one, you’re more likely to end up with a custody decision that works best for your kids. Divorce is rarely a straightforward process, and determining child custody is even more difficult. Often, having a mediating party can help make the whole process less fraught. 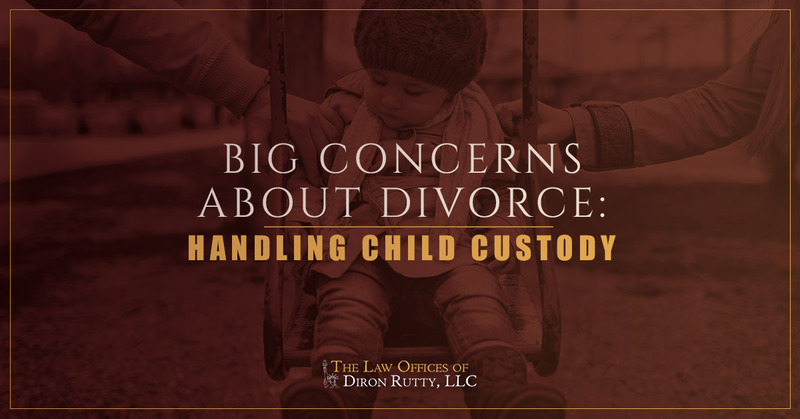 If you’re looking for a divorce and family lawyer in the Bronx or across New York City, connect with the Law Office of Diron Rutty, LLC for experienced, compassionate help.